Tele Vue received a CD-ROM in the mail with the cryptic title “Boggy Natives” hand written across the top. It was full of bird images. 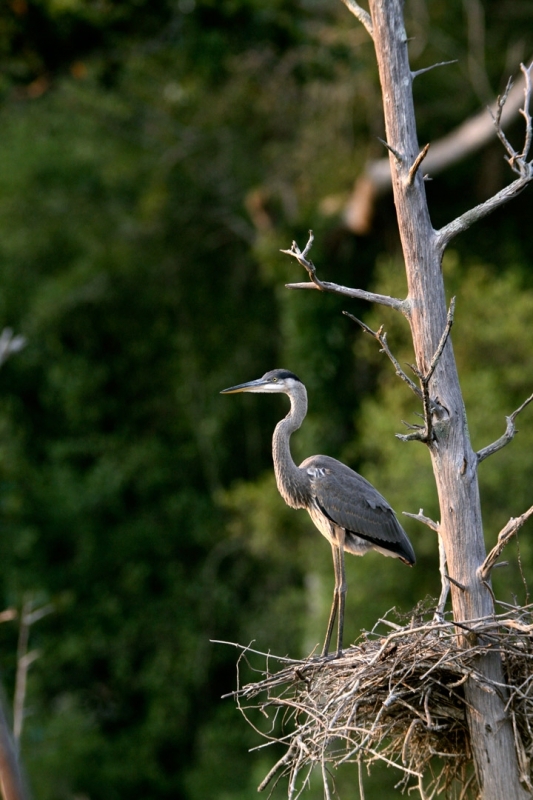 “Time to leave the nest (Heron)”. Copyright 2007 by Buck & Spence. Used by permission. Tele Vue-85 APO refractor with Canon EOS Rebel XTi at 1/125″ and ISO 400. 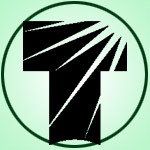 Image was cropped. Taken in the Florida panhandle. Doug has since obtained a couple of large telephoto lenses for actions shots. … The TV-85 beats both on sharpness, even the vaunted Canon 100-400L IS. Thanks for producing such a versatile and competent tool. Worth every nickel. People gasp and sit up straight when we show them the images. We gasped too! 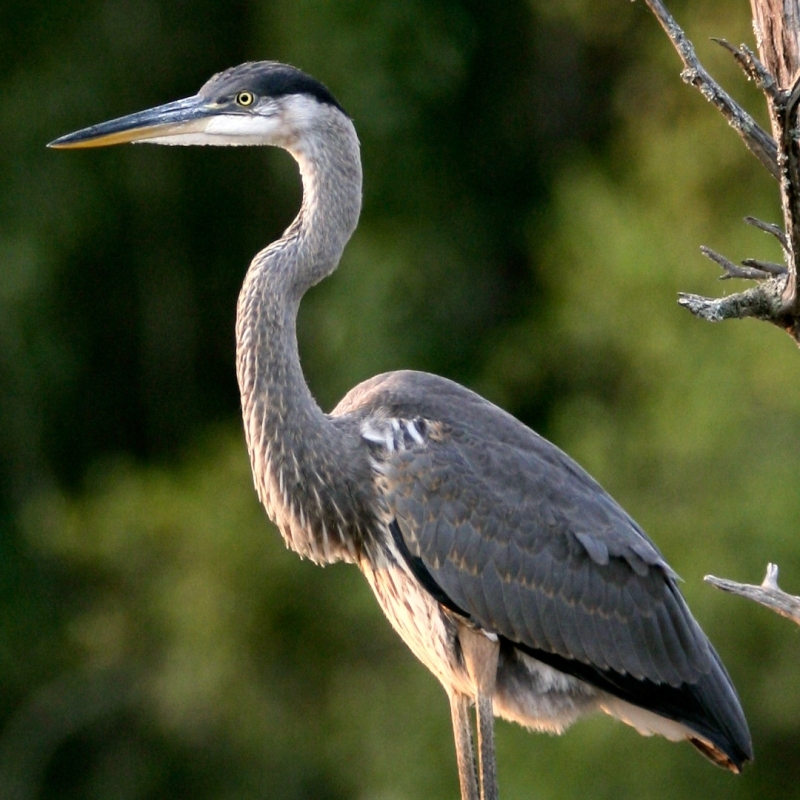 Here’s a closeup crop of the Heron. “Time to leave the nest (Heron crop)”. Copyright 2007 by Buck & Spence. Used by permission. The January 31, 2018 full moon was a trifecta for many moon-watchers that night. The moon was larger than average (a supermoon) because mid-eclipse was just 30-hours after its closest approach to earth; it was the second full-moon of the month (colloquially a blue moon); and in parts of the world it passed through the earth’s shadow (a lunar eclipse). Joe Beyer was ready to image this rare event with his Tele Vue-85 outfitted with a 2″ Tele Vue 2x Powermate amplifier. 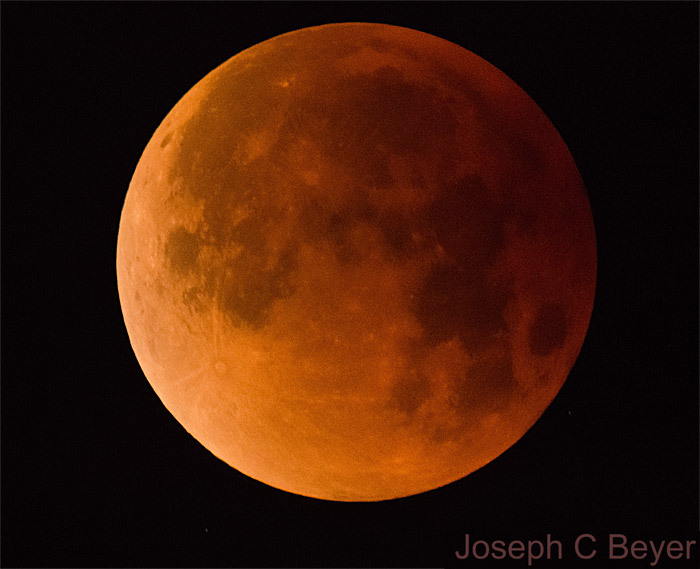 Blue Moon Eclipse by AstroBin user Joe Beyer. Copyright Joe Beyer. Used by permission. TV-85 APO refractor with Tele Vue 2x Powermate image amplifier (1200-mm effective focal length) with Nikon D7200 DSLR camera. We asked Joe for some background on how he got this image and he told us in his own words. I will not take astrophotography images ever again without using a guiding mount! There’s always a story behind every image — right? The image was taken from my back yard in the San Francisco Bay Area and I was very lucky to get a good one. I got up at 2:30 AM and the weather was perfect. I planned to take the images using a stationary tripod, as I had done many times before when getting moon images, and had no problems taking the phases prior to the full eclipse. When the full eclipse started the light level dropped so much that I was having a hard time freezing the moon motion and still getting an adequate exposure. To add insult to injury I had a brand new Astro-Physics mount sitting in the living room — less than twenty feet away — but by then there was no time to set it up! Changing the ISO and shutter speed, I was finally able to get a couple shots that looked good. Lesson learned, I will not take astrophotography images ever again without using a guiding mount! This next image was a labor of love. It is a wide-field view of the rich nebulosity surrounding the reflection nebula cataloged as Van den Bergh 141 — also known as the Ghost Nebula. To capture the detail in the image below required a fast instrument and a lot of time. 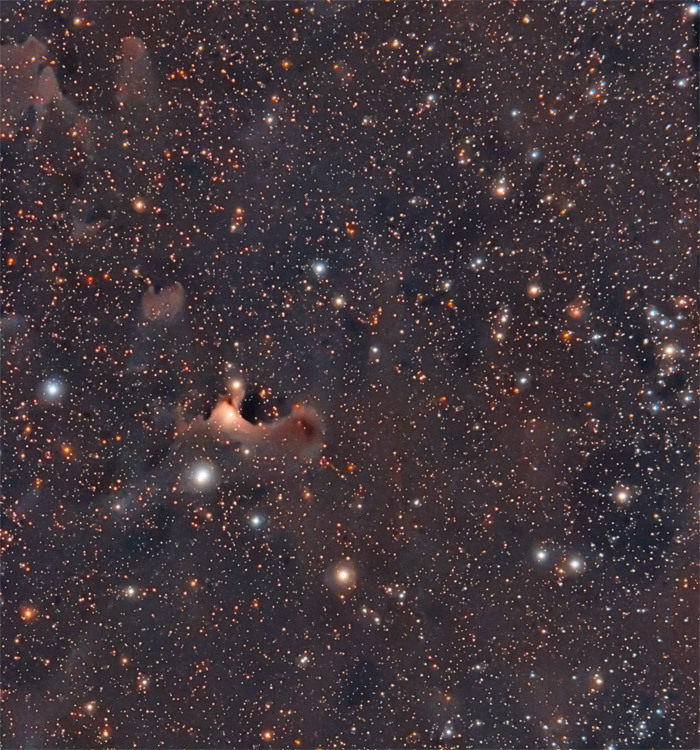 VDB 141 Wide Field by AstroBin user Carlos David. Copyright Carlos David. Used by permission. Tele Vue-85 APO refractor with Tele Vue 0.8x Reducer/Flattener (480-mm effective focal length at f/5.6) into Canon EOS Rebel T3i DSLR with Astronomik CLS Clip light pollution filter. 140 x 600″ for 23.3-hours total exposure. From his home in Sudbury, Massachusetts, Carlos David took over 23-hrs of exposure in September, October, and November of 2014 to create the VdB141 wide-field image. His Tele Vue-85 was equipped with our 0.8x Reducer / Flattener and Canon EOS Rebel T3i DSLR with Astronomik CLS Clip light pollution filter. This setup had a 480-mm effective focal length at f/5.6 and over 3.1° field on the diagonal of the APS-C sized chip. He took 140 exposures of 10-minutes each (the sky fog limit) over those months. 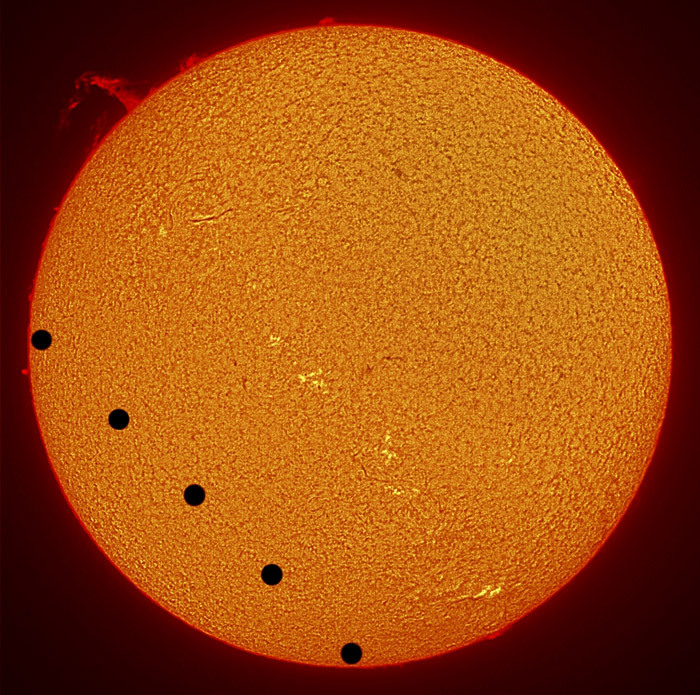 That was followed by experimenting with software to pull out the celestial details from the background noise. Tele Vue-85 OTA in Ivory (WXO-3372). With an 85-mm APO (Doublet) objective and 600-mm focal length, this f/7 refractor offers a combination of optical performance and airline portability that delights amateur astronomers, birders, and reviewers alike. Evaluation of double-stars, viewing lunar detail, viewing deep sky, and photographic uses were reported in Sky & Telescope as: “Truly awesome! …Incredible!…the view almost blew me off my chair!…” The conclusion, “…an extremely powerful, compact instrument capable of delivering stunning images of the universe.” Maximum field-of-view is 4.4° with our 41 -mm Panoptic (14.6x) or 55-mm Plössl (10.8x). The 4.0° field-of-view of the 31-mm Nagler (19.4x) is another option for wide-field/ self-finder use. 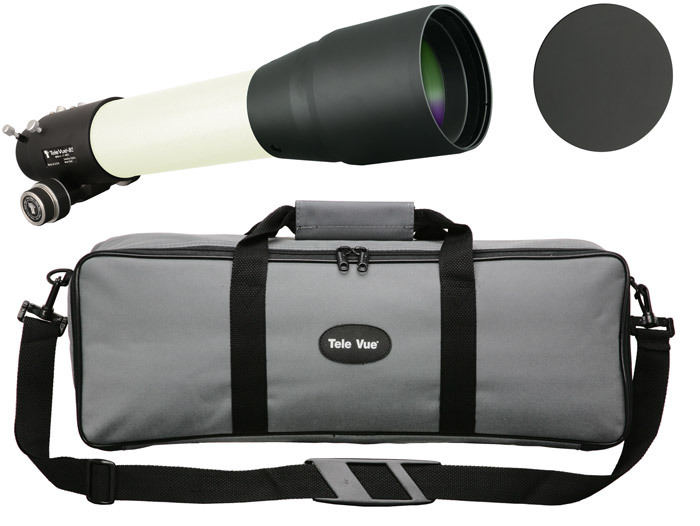 Available in ivory or green powder coat, the optical tube includes: 2″ Focusmate 10:1 dual speed, rack-and-pinion focuser with dual tension adjustment screws on the drawtube and dual lock screws on the end-ring, sliding metal dew shield, screw-on metal lens cover, and soft carry case. 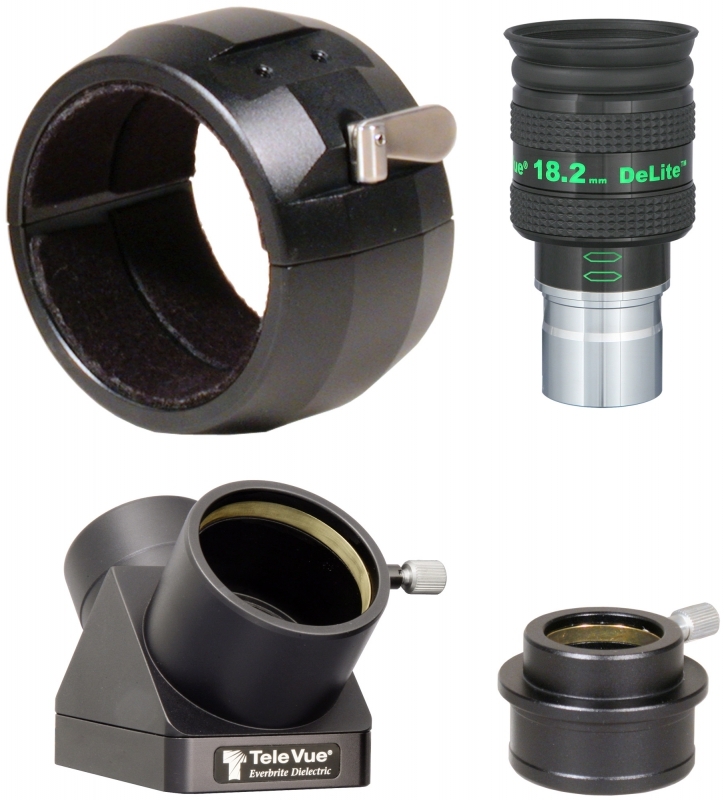 Optional TV-85 Accessory Package (TVP-3373) adds 3” tube ring- with mounting threads, 2″ Everbrite (99%, 1/10-wave) mirror 90° diagonal with 1¼” eyepiece adapter and brass clamp rings, and 18.2-mm DeLite eyepiece with 20-mm eye-relief that yields 1.8° true field of view at 33x in this scope. Our small APO doublet refractors offer a combination of versatility, performance, portability, and build quality unique in the market. We design our own apochromatic objectives to produce startlingly natural images whether it’s the Moon, planets, or birds! High power images are essentially free of detail robbing color fringing at the diffraction limit and contrast is maximized using glass-tuned multi-coatings and dead-flat baffling to control stray light reflections. More Buck & Spence images on the “Image” tab of our Birding site. Previous Previous post: Tele Vue: We’ll Always Have Paris!